Consider writing about aliens, in an alien setting. Not “costume” aliens mind you, but imaginative different beings in fundamental ways. Calling it “Bill” is campy. Making up some noise and trying to spell it in English is not right if the kinds of sounds they make are quite different than human language, or they don’t use sound at all! Using glyphs that the reader will be totally unfamiliar with can be interesting and even inspiring in a vignette or short work with a small number of such alien words, but would be difficult to keep straight for a longer work and might frustrate some readers who process language verbally even when reading/writing. Using Native American style names or translating the name to a literal meaning imposes this facet of culture onto the aliens which might not be what you want (and why would all alien cultures work that way?) and runs into problems as things in the natural world they are named after are themselves alien! That is, Fat Bear is as bad as Bob since they don’t have bears but have «untranslated». For names that are not formed this way, think about our own: what does Paul or John mean literally, to translate as a word? Few of us know where the words came from and they’re only used as names now. Translating Paul from Latin to English as humble or small doesn’t keep the flavor of a dedicated name word. So what can you do when writing about aliens? Example: I got to thinking of this issue after writing the vignette at the end of this post. The aliens are not interacting with humans. Rather, the story is set in an alien society. Think about the middle part of The Gods Themselves, or the Orthogonal universe. Paul, whose real name resembles a soft purple light in their own language, was an alien with light based communication method. Edit: Since buried behind many comments, @Cecilia suggested names that resembles the original names of the aliens like Violet in the previous example. This isn't perfect, but it works for me. I invent the names of alien characters. Trying to keep their construction according to what is usually an intuitive set of rules. This can be by looking at words and names in, say, a Scandinavian language, using that as a template and modifying their linguistic structures into something sufficiently different until it feels right for my aliens. Or creating hybrids between dissimilar languages, for examples, recombining words from Chinese and German. So the German name "Landau" could become "Landao" or "Landiu" or "Landeng" by changing the last two vowels. This isn't a set of hard and fast rules. Mainly it is a matter of feeling a way into what is going on with the aliens and whatever their names are going to be arising from trying to find what tastes right. As well as following Gene Wolfe's precept that invented names should be pronounceable by an English speaker. Whatever approach taken is usually dictated by what type of alien the story is about, because different kinds of aliens will need to have different types of naming and linguistic associated with them. To reflect something about the character and nature of alienness, and their role in the story. Basically it's horses for courses. If are interacting the aliens then we will probably give the new names or just take the meaning of their name and translate that into English or some other earth language. I guess my answer is it doesn't matter what their name their language is for convenience sake we would have renamed them. Scenario 1: Humans are the dominant or most populous species, and the aliens are minority visitors. Scenario 2: Humans are the minority among an alien populace. Scenario 3: Humans are one of many species in a giant melting pot of vastly different cultures, where no one species is truly dominant. For a viable scheme in scenario 1, look at the way that humans give names to foreigners in our own countries. We use what is familiar to our own native culture. The masses will never go out of the way to learn a new writing system or pronounce syllables that aren't in their native language. Therefore, they transliterate the foreign name in their own writing system, with pronunciation that is manageable. A transliteration into English would not be optimal for reflecting the culture, literal meanings, physiology or native communication methods of the alien species... but then again, how many Khoe words do you understand? How many Khoe words can you pronounce correctly (it uses a system of clicks) even if you know the meaning? Our goal is not to reflect their language and culture - it is to be most utilitarian to our language and culture. A moderately easy-to-pronounce verbal name would be used in that world, because humans use names and communicate verbally. Also note that names typically aren't translated even when they have a literal meaning: if a French exchange student's name is Fleur, you don't call her Flower. Scenario 2 is the exact opposite of scenario 1, and doesn't need much more explanation. We would adapt to whatever their communication method is (see Scenario 3), and our identity (they might not use names, or use individual identities at all) would be reflected however it would in their world. This is difficult to write about without first giving your audience an understanding of the alien culture, so that would have to come first. Scenario 3 is the most difficult of all. Methods of communication utilized by each alien will vary vastly depending on species. Do they communicate telepathically? If so, communication is much more abstract and direct than our spoken languages. Do they have optical organs that produce pulses of light? Create sounds at frequency ranges that can't be heard by the human ear? Use of sign language with appendages that humans don't have? The characters would likely emulate a lot forms of communication (which could really cause some fun/trouble for an inept traveler! ), or some sort of basic universal language would possibly be established (for trade at the very least, like pidgin languages). For Scenarios 2 and 3, in the story, names (and communication in general) should probably at least be transliterated (via technology perhaps?) into something that human senses can understand and their faculties can express - otherwise, how would humans in the stories be able to understand or express themselves to the other species? And double otherwise, the mechanism becomes an obstacle to the story you are trying to tell, and makes it less enjoyable (like a profusion of glyphs the reader is unfamiliar with, as you mentioned). So, that points back to the realistic (if boring) system in Scenario 1. Using glyphs .... would be difficult to keep straight for a longer work and might frustrate some readers who process language verbally even when reading/writing. Tolkien invented his own languages to instill the races he was referring to with their own culture. Perhaps it is worth some time to analyze how he balanced the use of an invented language in a literary form and if it respects the norms you are trying to achieve. Of course though, he also had a systematic way of creating the language based on his linguistic studies, so that maybe a hurdle to jump. Example I am Lrrr, ruler of the planet Omicron Persei 8! I don't think you can escape the Human interpretation of language, At least, when you first introduce, because the audience you are writing for will be human. Perhaps the best way to right about alien culture and come up with an alien language that is both realistic, yet repeatable would be to analyse how you would explain something you understand deeply from one culture and explain it to somebody that is in another culture, of which you straddle both. But any of those things, will loose things in translation. For example if we explain to an American the Chinese cultural concepts of Face, you might first describe it in terms the American will understand. "It's like being embarrassed." That's a simple explanation but it is missing a ton of nuances. Expanding on it, one might describe what a person who has lost face would do, or explain what another might do to save face. Now it is a little less nuance. But to truly understand it, there needs to be years of experiences to help fine tune the understanding. Which could be acquired when you say, accidentally make a friend loose face and then have to deal with the aftermath. Then you have to explore yourself and the culture to try to mend the relationship. Further adding to the nuance of the concept of face. So on and so forth. I think it's in this way you can explain or put life to an alien culture or language. You can try to look how this has been done in other media. The first thing that popped into my mind when I read this post was a scrap of song from Secret Agent Man, song written by P. F. Sloan and Steve Barri and recorded by Johnny Rivers for the American broadcast of the British spy show Danger Man (aired as Secret Agent in U.S. 1964): "They've given you a number and taken away your name.."
I thought, well, that's a little cold, though it would play with something like the Borg, i.e., "I am No. 2,854,345. Resistance is futile." Then I recalled the autistic savant Daniel Tammet, who sees numbers as shapes, colours and textures. Daniel also creates his own language (a conlang) using vocabulary and grammar from the Finnic languages. For example, kellokült, or "clock debt" to represent the concept "being late." So, how about aliens who have this synesthesia combined with superior mental capacities such that they do indeed represent themselves as uniquely assigned numbers for the purposes of maintaining records (they can undoubtedly recall each other distinctly merely from perfect recall of all physical and mental attributes) and for polite address and communicating with other species. Their number would be pronounced as the target species word corresponding with a shared image capturing the visual and mental representation of that number. For example, say alien #254,389,400 was "seen" by his fellows as a golden pyramid shape with encircling ellipse. He might introduce himself to an earthling as "Golden Giza" (an encircling ellipse might well alliterate as a "girdle," but I thought the laughter might be excessive by this point). With publisher support for graphics, a story about such aliens might use small avatars representing these shape-number names. 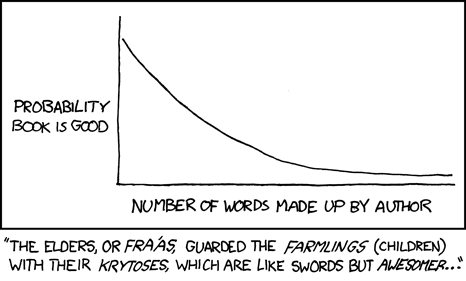 Warning: some well-intented authors heavily abuse the use of unknown words to make the writing more "exotic". The end result can however be hard to immerse in, with constant thinking like "What is this kagklgor beast the hero is jumping on again ? Is that the 6-legs horse thing ? Or the flying giant rat ?". The remark stand for names, locations, species, etc. Language being used by human to communicate with each other and transmit information, using meaningful words also has its advantages. Starting from a descriptive word combination, and subtly playing with it can be an option. An example is Stephen R. Donaldson using imager for some magi that get their power from images in mirrors. Isn't that simple and understandable ? For a comic example of what happens in you readers mind when abusing exotic names, enjoy this funny strip. Think outside the human box. Start from a conceptual point of view, if you can. That is not intended to be insulting, simply not everyone has talent, skill, or practice at thinking differently from how they usually do so. What is important to this culture? What makes this culture unique? What do they value and desire? Some good sources for inspiration are, interestingly enough, early sci-fi and space opera writers. They would take one particular aspect, some behavior or physical difference, and make an entire culture out of it. Exaggerate some way of thinking or belief, and take it to a logical extreme. Or take some "normal" thing, and minimize it to see how it would affect daily activities and interactions. The great thing about this method is that you yourself don't necessarily have to understand the "why" of it, just the mechanics of what they will do when, to get across the feel. Let the readers guess at the why part. When it comes to names, again, what is significant to these aliens? What is important? On Earth, some cultures believe that the name you give a child determines their destiny, so if you give them too hard or too great a name, it will curse them and doom them to a life of unhappiness, unless they get lucky and actually fulfill the meaning of their name. As a result, most girls in that culture are named after flowers, gems, and other pretty things, while boys tend to be named after animals, numbers, or things. When I was speaking with someone from that culture, and told them the meaning of my name, they were shocked and immediately tried to figure out how to downplay the translated meaning of my name in their language into something more modest and survivable. ^^ By way of comparison, another culture translated my name and that person wound up exclaiming how auspicious it was, yet at the same time conflicting. Another culture here on Earth has the unique practice where teenagers will gather on the hills, boys on one and girls on another, and will form groups to compose a bit of song and/or poetry about the person that one of that group likes. The target girl or boy doesn't know which in the group is the one who actually likes them which can give some courage to the young hopeful. They sing back and forth to each other so their names need to be something that works well with song and verse. It is utterly charming to listen to them sing back and forth to each other. Once you have your concept, think of various names that said concept-culture would produce based on what they value and believe and want their children to value. Perhaps make up your own name convention, such as the Native American style name, but different for each species. If a particular race happened to live on a planet, which had an atmosphere that, due to its unusual composition, happened to change colour on an almost daily basis, it might have become a tradition to name a child according to the colour of the sky that day, causing names (once translated) like Red, Blue, Orange (or whatever). Because you seem stumped in writing 'campy' typical alien names here is an idea: Step outside the box, put emphasis on your characters traits and personalities to the point where you do not need to write their names. It might make for a rather interesting writing (and reading) experience too. I.e. Take Hagrid from Harry Potter. Because of the way the book is written there really is no choice to name him constantly, but look at any passage he's in, is their really a point in naming him? Other than it not seeming odd when everyone else is named? Any time he does something, it's either obvious it's him by the scope of the action, or you can simply describe him with a few words (Huge, Giant, etc...) and any time he talks is unique also. Or less friendly examples, "Second of liars and spies" and presumably "Fifth of slave breeding and sacrifices". (Read Charles Stross's latest for this source). That aside you may as well give them names pronounceable in English. Analysis of dolphin noises suggests that they have sounds for referring to themselves. These sounds are inaccessible to unaided human ears, let alone vocal cords. If humans and aliens have any shared vocal abilities, pick names that are mutually speakable (probably using a restricted set of syllables). In passing: until we can work out how to communicate with dolphins and where they fit on the intelligence spectrum, I hope we do not meet any real aliens. An African Grey parrot named Alex learnt English, proved human-toddler-smart and ultimately broke our hearts. AFAIK no humans have learned parrot. Not the answer you're looking for? Browse other questions tagged aliens language worldbuilding-process or ask your own question.